Radon is a naturally occurring gas produced when uranium breaks down in soil, water and rock. It enters the earth’s atmosphere through porous soils and fissures in the earth’s crust. Radon can get into your home undetected through foundation cracks and similar unsealed openings. You can’t see it, smell it or taste it. Radon gas is virtually harmless outside since concentration levels are extremely low. 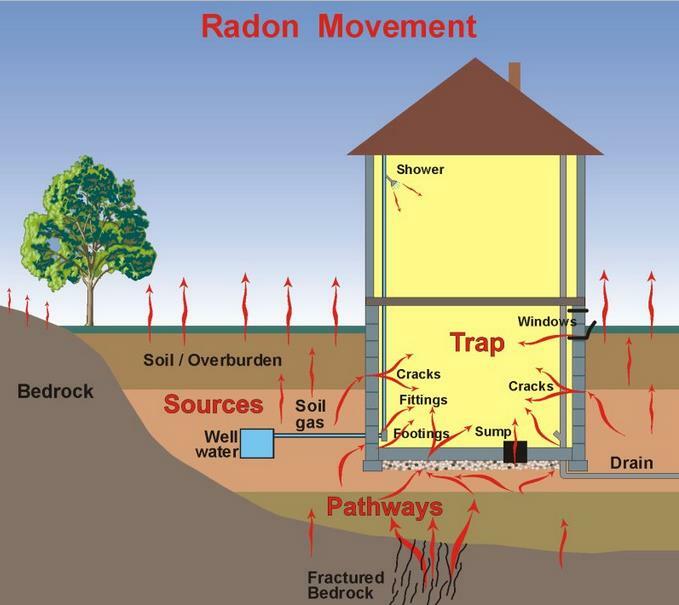 When Radon finds its way into buildings, usually through basements the gas decays over a short period of time. The result of this decay process becomes the health concern. The product of the decay of Radon are solid, radioactive particles which attach to dust and can be breathed in and remain in the lungs. It has been clearly stated, through research, that long-term exposure, especially for smokers, to elevated levels of radon in the home increases your risk of developing lung cancer. Radon is the 2nd leading cause of lung cancer after smoking. The only way to know the radon level in your home is to have a simple and inexpensive test. Long term testing for a minimum of 3 months is recommended. Measurements gathered over a longer period of time will be more accurate and will provide a much better estimate of a person’s annual average exposure. If a high level of radon is detected in your house, you can take steps to remove the radon gas. The single, most important, first step in this process is getting your home tested. If the radon level is found to be high, it can be fixed at a reasonable price. The best time to test your home for radon gas is during the heating season, October to April. During this period we tend to keep our windows and doors closed, which allows for a more accurate measurement of radon concentrations in the indoor air. SICK BUILDING SOLUTIONS CAN ASSIST YOU WITH THE TESTING AND REMEDIATION PROCESSES!!! If your home radon test reveals levels of 200 Bq/m3 (Bequerels) or higher it is recommended that you take steps to lower these radon levels. Sealing cracks in the foundation or at the wall/slab joint. Look also for any openings around pipes or cables entering the wall below grade. Improve the ventilation in your house, especially in those confined spaces close to rocks and soil. Ensure that your sump pump it is prop¬erly sealed. CALL US TODAY FOR AN ESTIMATE……………WE CAN HELP PROTECT YOUR FAMILY!